It has been real hot lately. Hot for Victoria anyway, our little temperate rainforest with lovely stabilized temperatures where it never gets too hot or too cold. But for me it feels sweltery. I always have the good sense in these moments to do some cooking that requires me to turn my oven on and heat my house into a sticky, muggy nightmare. It’s like a DIY sauna, but with cookies at the end. In this case, one huge cookie, baked up like a pie in a skillet. And it’s worth the heat to get a slice of warm cookie with slightly melty ice cream. A crispy-edged, warm and slightly gooey-centered salty-sweet slice of cookie. Cream together butter and sugars until very light and fluffy, around 5 minutes. Add eggs, one at a time, beating after each egg is added. Scrape the bowl well to ensure all ingredients are incorporated. Add flour, salt and baking soda and beat until just incorporated. Add chocolate chips and fold through the dough. Spread cookie dough into an 8 inch skillet and sprinkle flaky salt over the top. Bake at 375F until golden brown on top and just set in the middle, about 30 minutes. Let cool slightly and serve with ice cream. I don’t usually like double chocolate style cookies very much. I often find them to be cloying and lacking in necessary flavour contrast. And so I would probably never have made these, if my sister hadn’t made them a few years ago and completely won me over to these odd, delicious little cookies. I should have known that anything from the undisputed cookie genius Dorie Greenspan would be a winner. These are all about texture. They are a modified version of french sable cookies, which means sand cookies, with the untraditional addition of brown sugar. They are somehow sandy and chewy at the same time, which might not sound delicious (sandiness not usually being a plus in cookies) but it is. They are delightfully sandy and nubbly, and with a rich chocolatiness that isn’t overwhelming or cloying. With the paddle attachment, beat butter and sugars together in the bowl of a stand mixer (or with a hand mixer) until fluffy, around 3-4 minutes. Add in vanilla and salt and beat briefly to incorporate. Add in dry ingredients and mix on the lowest speed to avoid flour explosions. Mix until all flour is incorporated. This dough is a little unpredictable. Sometimes it comes together into big buttery lumps, sometimes it stays crumbly and dry looking. Either way, the cookies will work, but if you have a crumbly dough, you will need to give it a gentle knead to bring it together. Shape the dough into two logs about 2 inches in diameter. Wrap in plastic wrap and chill in the fridge for at least three hours. Heat oven to 325 degrees. Slice cookies and bake on parchment lined cookie sheets for 12 minutes. Transfer to a cooling rack. There are a lot of mediocre cookies in the world. I'm thinking particularly of chocolate chip style cookies - there are a lot of ways to go wrong. I am not a fan of cakey cookies, that don't spread enough and stay high and puffy in the middle. I don't them totally crispy either, they should be thin, just crisp on the outside, but should definitely have chewy, nearly underdone middles. 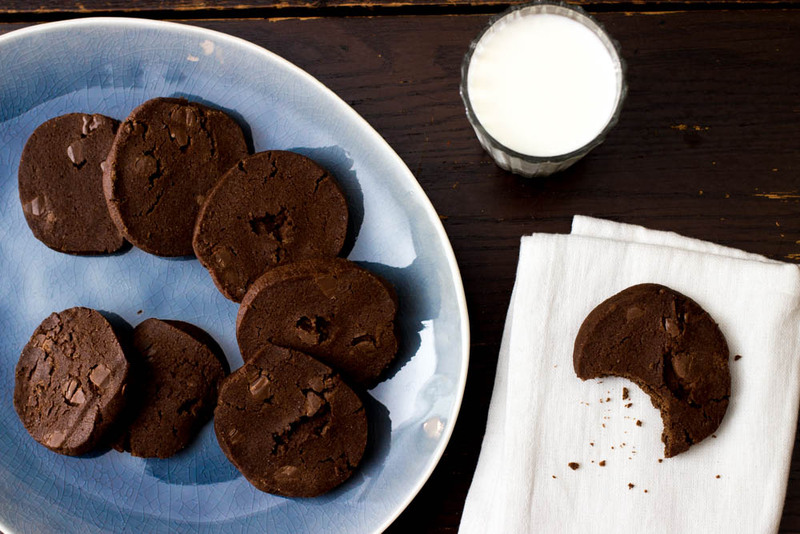 These ones, from cookie genius Dorrie Greenspan, really meet all my cookie requirements. They are thin and spready and have wonderfully wrinkly tops. They stay chewy in the middle and have perfectly crisp edges. You can go traditional and use chocolate chips and maybe some walnuts. Or you can try white chocolate, pistachios and blueberries like I did here. Both ways are great. You can use dried blueberries if you can't find the freeze dried ones, just don't use fresh or frozen, they'll make the cookies goopy. Freeze dried fruit is kind of hard to find, but you can order it online or check a camping supply store. Feel free to substitute another freeze dried fruit or dried fruit. I think raspberries would be great in these too. Combine flour, baking soda and salt in a medium bowl. Beat butter in a stand mixer or with a hand mixer, until smooth and fluffy. Add sugars and continue to beat until well combined. Add vanilla, and eggs one at a time, mixing well between after each. On low speed, add in flour mixture, mixing until just combined. Stir in chocolate, pistachios and blueberries with a spatula. Scoop 2 tbs mounds of dough onto baking sheets. They will spread a lot, leave 2 inches between cookies. Bake around 10 minutes, turning sheet halfway through baking. Snickerdoodles are quite a subdued, subtle cookie: soft sugar dough rolled in cinnamon sugar, baked until either chewy or crispy. But the name snickerdoodle sounds boisterous and unruly, like the name of a cookie made out of M&Ms and pretzels and marshmallows. The name etymology is disputed, but possibly stems from the German for snail noodle. I prefer to imagine that snickerdoodle means small humorous drawing. Whatever it means, there is a serious goofiness discrepancy between the name and the cookie. If you can move past this incongruous naming, you will be rewarded with a really fantastic cookie. These ones fall on the crisp side of the snickerdoodle spectrum, they are thin, with a shattery, cracked top and just tender middles. They really spread while baking so I only baked 6 cookies at a time on a baking sheet. The sheet will seem too empty, but they will really expand in the oven. Preheat oven to 400°F and line cookie sheets with parchment paper. Combine flour, cream of tartar, baking soda and salt in a bowl. Cream butter, shortening and 1 1/2 cups sugar in a stand mixer until light and fluffy. Add eggs and vanilla, beat on medium speed until combined, scraping down the sides of the bowl. Add dry ingredients and beat until evenly combined. Combine 1/4 cup sugar and cinnamon in a small bowl. Scoop balls of cookie dough with a medium cookie scoop or ice cream scoop and roll them in the cinnamon sugar. Place far apart on a cookie sheet and bake for around 7 minutes, turning the sheet half way through baking. I'm totally fascinated by aquafaba, a new egg white substitute that has been getting popular in the last year or two. Aquafaba is something I have been unknowingly throwing away for years, and before I saw it in action, I couldn't really believe that it was actually going to work. Aquafaba is chickpea brine, the water that I have been tipping out of canned beans and pouring away down the drain! But it has a secret power to become an uncanny egg white replacer. It makes very fluffy, glossy meringues indistinguishable from egg white meringue. Uncooked aquafaba meringue has the faintest beany smell, but sugar and a bit of vanilla takes that away, and cooked, the stuff is an incredibly convincing egg white mimic. To make it work, it helps to reduce the aqua faba by about 25% to thicken it slightly, so 1 cup becomes 3/4 cup. To reduce, heat over medium heat in a small pan for around 10-15 minutes, checking the volume frequently until you get 3/4 the original volume.Now, every time I eat chickpeas I save the liquid in a jar in the freezer for later. I can be frozen and then reduced after, or reduced and then frozen. These cookies are soft and chewy, with a molten, caramelly little jam puddle through the centre. Grind almonds and walnuts in a food processor until mostly finely ground, a few bigger pieces are ok. Combine nuts with sugar, cinnamon and vanilla in a medium bowl. In the bowl of a stand mixer, mix aqua faba with the whisk attachment on medium speed until very frothy, about 3 minutes. Fold into nut mixture. Cover and refrigerate for at least 1 hour, overnight if you like. Heat oven to 325°. Scoop golf ball sized cookies onto a parchment lined baking sheet and cook for 15 minutes. Remove from oven, cool for a couple minutes and then carefully make in an indentation in the centre of each cookie. Drop a teaspoon of jam in each and then bake 10 more minutes, until the bottom edges of the cookies are golden brown and jam is bubbling.